We always welcome feedback from clients and we are so thrilled with their responses. We've recently asked a few clients to write short reviews of how their events went, and we'd love to share these with you below. Plus, here's a cover of Caledonia to listen to while you read. How did you find the booking process? Very straightforward, just what every bride wants! Josh was always at the end of an email to answer even the smallest of questions. He was very accommodating and attentive ensuring that we had a tailor-made booking. We appreciated the personal touch which made us feel like Ghillie Dhu were "our wedding band". How did you find G﻿hillie Dhu on the night? Amazing! They were very organised, setting up in advance to avoid noise during the meal and speeches. They started promptly and got everyone on the dance floor quickly. Their music has great variety and is modern with the traditional elements that keep them suitable for a good ceilidh. They responded to us on the night when we asked to miss out certain dances that were unknown in our area and none of this was a problem or caused offence, which was great! My personal highlight was dancing Orcadian Strip the Willow to ACDC - who else can do this so well? We have had huge numbers of compliments from many of our friends and family. Thank you Ghillie Dhu! Would you recommend Ghillie Dhu to other clients? "Orcadian Strip the Willow to ACDC - who else can do this so well?" How did you find the bo﻿okin﻿g proc﻿ess? Efficient and straightforward. They answered any questions promptly and were happy to accommodate any specific requests. They liaise with the venue for all technical requirements and are great value. How did you find Ghillie Dhu on the night? All 3 ceilidhs have been absolutely brilliant. Ghillie Dhu are excellent musicians and I guarantee will do everything in their power to ensure your night is a great success. Their unique blend of tradidtional music with a modern twist gets everybody on the dance floor - they even have the power to drag students away from a free bar! The band adapts their music to the venue & number & ability of the guests so by the end of the evening your party will be jumping and guests will be exhausted - I assure you that a Ghillie Dhu ceilidh will be remembered for months if not years! "A Ghillie Dhu ceilidh will be remembered for ﻿months﻿ if not years!" "We didn't have to worry about a thing"
The booking process was very straight forward and the band were always on hand to answer any questions or queries we had. They were absolutely fantastic! We didn't have to worry about a thing and they kept everyone dancing all night long! We had a lot of guests who had never been to a ceilidh before and they made all the dances extremely easy to understand and no-one felt left out. They also balanced the mixture of modern and traditional music perfectly. We cannot recommend these guys enough! Extremely laid back and stress free, what every couple planing a wedding needs. "The variety in types of music was perfect"
The booking process was very easy and relatively informal, the band were very accommodating with regard to preferences. The band were excellent. The variety in types of music was perfect for the audience and all guests (including husband and wife) thought it was a fantastic night. Appreciate the instructions prior to ceilidh dancing considering the number of non-scottish guests, this appeared to be well received. "I had multiple guests say how good the band were"
Josh was extremely easy to work with during the booking process. Really quick to reply to emails and was always available to take a phone call. The final phone call a few days before the event was really helpful and clarified everything. On the night the guys were incredible. The selection of music from traditional ceilidh dances to start the night to some more fast paced ones at the end was brilliant. The covers the guys did for the second half of the ceilidh were exceptionally good and I had multiple guests come to us and say how good the band were. We would highly recommend Ghillie Dhu to anyone that needs a wedding band. "the music was just so cool"
Great! So kind that you took the time to meet with us and discuss a) how it would all work and b) our preferences. 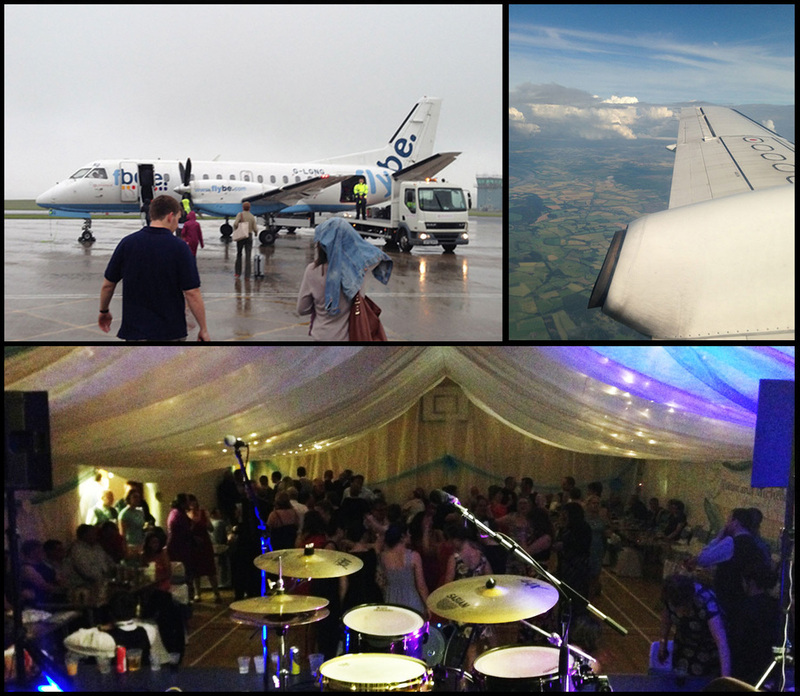 There was no time closer to the wedding - so we really appreciated being able to do this upfront! Amazing... we had a wedding full of people who had never ceilidh'd before... and they loved it! In fact it was them that wouldn't get off the dancefloor. You were fantastic at explaining the dances and getting people clued in... but let's be honest the music was just so cool as a mix between old school ceilidh and recognisable songs that people were just loving it. Absolutely - such a good band... young and modern - makes for an amazingly fun night! The above reviews are our latest and greatest. Click here to have a read of our previous testimonials, dating way back to 2007. Alternatively, if you have a question you'd like to ask the band, just fire us a message on the Enquire page. Been to a recent ceilidh? Feel free to leave us a review here!